It is my belief that the call of God to be an intercessor is the ultimate opportunity and responsibility to which one may be called. The extent to which Abraham placed himself before Jehovah over the cities of Sodom and Gomorrah is beyond most moderns to comprehend. Moses asked God to forgive his idolatrous people or send him to hell with them (Ex. 32:32b). The nation of Israel was on the edge of justifiable extinction — but for one meek man on his knees (Ps. 106:23). Jesus had the weight of the entire human family on his shoulders — the intercessor of all intercessors! BUT for Gethsemane, no Calvary. The entire human family would have been ultimately consigned to that final Gehenna, prepared for “the Devil and his angles.” Intercessory prayer? Is it important? 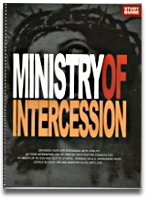 The following album of 12 CD/DVDs will help prepare one for that great partnership — pairing with God!